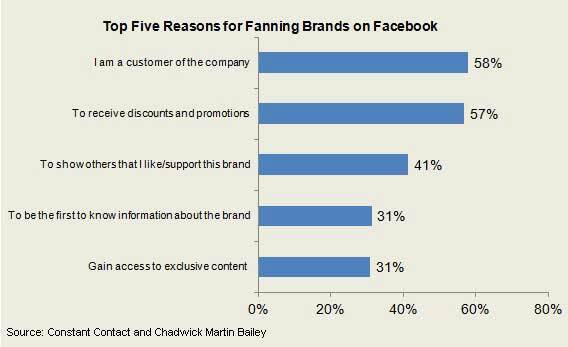 Nearly six in ten (56%) Facebook users who “like” brands on the social networking site say they are more likely to recommend a brand to friends after becoming a fan, compared with one-third (36%) of brand fans who say they’re not likely to do so, according to a study by Constant Contact and Chadwick Martin Bailey. Below, additional findings from a study by Constant Contact and Chadwick Martin Bailey, which explores how Facebook users who are friends of brands interact with those brands on Facebook. More than one-half of brand fans say they’re more likely to buy products for many of the brands (16%) or a few of the brands (35%) they “like” on Facebook, compared with 41% who say they’re not likely to do so. Interestingly, brand fans age 50+ are more likely than adults overall to buy more products for at least a few brands (44% vs. vs. 35%). Facebook users clearly have their preferences on brand communications: 69% of brand fans say they want to hear from some brands more often than others, whereas 31% prefer to hear from all the brands they “like” with equal frequency. Most (77%) brand fans interact with brands via brand posts, newsfeeds, and offers posted by the brand, whereas 17% share experiences and news stories about the brand with other Facebook users and 13% create their own posts about the brand. 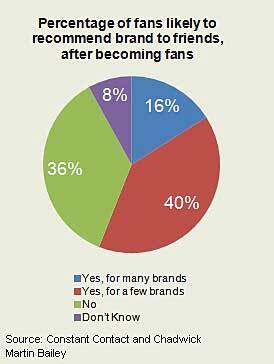 Most (58%) brand fans say they “like” a brand on the social site because they are a customer and nearly an equal proportion (57%) become a fan to receive discounts and promos. Exclusivity is key for many people: 31% of brand fans “like” brands to gain access to exclusive content, while 31% do so to be the first to receive information about the brand. Only 15% of brand fans say they have “unliked” a brand, whereas 76% have never done so with fans under age 35 the most likely to “unlike” a brand, according to the study. 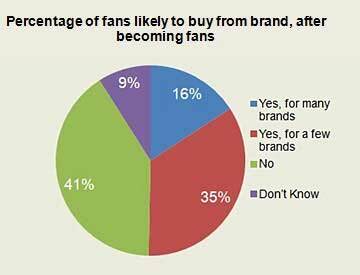 78% of people who “like” brands on Facebook “like” fewer than 10 brands with roughly 33% liking 1-2 brands.